This is the throat energy valve. Here the back of the neck elongates and the throat softens. If you are sitting, the direction of the movement is such that the occiput moves upward (toward the vertex) away from the shoulders (as the posterior muscles of the neck elongate and relax). Here the occiput also moves slightly posterior (backward), so the chin drops inward as well as downward toward the sternal arch. This movement is not linear but rather sequentially curved, the general direction is that the hyoid bone moves toward the occiput as the occiput lifts off the shoulders, the shoulders stay down toward the sacrum, while the center of the chest moves forward (the middle back remaining extended). In other words hunching the shoulders forward to get the chin to rest on the sternum will not effect the benefits of jalandhara bandha. Rather than conceptualizing the bandha as bringing the chin in toward the sternal arch, it may be more efficacious to visualize it as bringing the sternal arch up to meet the chin by moving the heart forward, sinking the scapula, and floating the kidney points at T12 backward and upward. This occurs by allowing the upper thoracic column to elongate and extend, thus relaxing and elongating tight shoulder girdle, chest, and neck muscles. Since these tight muscles are the property of the average person, attempting to force jalandhara bandha without adequate preparation may result in neck or upper back strain, but if one visualizes relaxation, lengthening, and softening into jalandhara bandha while seeking out its energy flow, then no strain will ensue. In this regard it may be wise to visualize the chin moving toward the sixth cervical vertebra (so the sixth cervical remains inferior and moves forward (anterior). Again the movement of the hyoid bone toward the occiput as the occiput moves up and back may be pivotal. 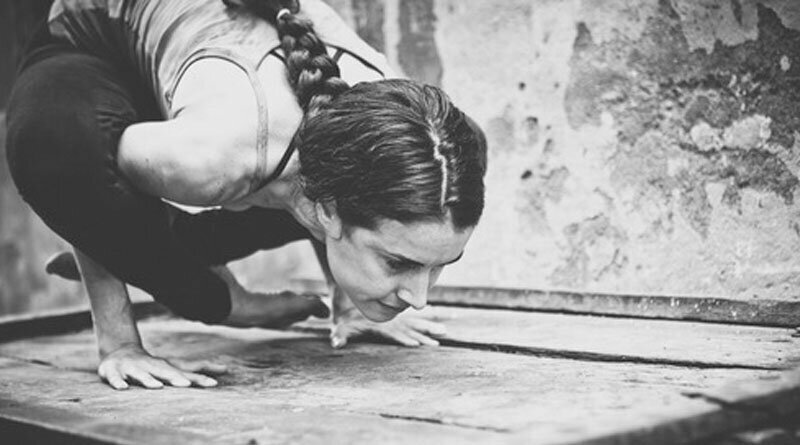 Preparations are halasana (plough), shoulder stand (sarvangasana), bridge (setu bandhu), cobra, and the like which work on either bringing the chest up to the chin and/or extending the upper thoracic at the same time. In these poses we should emphasize that the chin and sternal arch (the area above the sternum) do not move apart. Shoulder openers, arm grabs in back, chest openers, etc. are also beneficial so that jalandhara bandha can be done effortlessly, easily, joyously, and naturally without compromising any other part of the body. In other words avoid the common mistake of trying to force the chin down onto an already restricted chest. Simply relax the throat and neck by allowing the chin to drop naturally and then let the sternal notch at the bottom of the throat raise up to meet the chin as the hyoid bone moves toward the occiput. Jalandhara connects the head with the heart or basically opens up the throat chakra — the body and the mind. Because of the chronic dysfunctional nature of the separation between head and heart, the efficacy of the practice depends on leading from the heart not the head. This ensures that the heart stays open and there is no strain to the neck while the center of the armpits raise up and the scapula remains caudal and depressed (anterior) rather than being hunched upward. The back of the occiput raises straight up hinging over the atlas without disturbing the continued erection of the back of the neck. Even if you can not do the full bandha physically, you can still get the effect of the throat lock by moving in these directions without straining. As a preparation simply observe the bobbing motion of the head and neck while performing deep diaphragmatic breath. Observe the motion of the head and neck while performing jalandhara bandha. In pranayama practice, jalandhara bandha is usually held at the end of a full inhalation and/or at the end of a full exhalation (called kumbhaka where the breath is not moving). However holding the breath (kumbhaka) is not advised until all the preliminary pranayama practices have become mastered. If you have developed a degree of sensitivity to the energy body, you can hold the breath only if it feels natural and spontaneous. Do not perform this exercise if you are suffering from the residual effects of whiplash, otherwise it is an excellent exercise for the entire body/mind. To get its energetic effects this bobbing motion can be done very subtly almost unperceivable to an observer, but yet containing the necessary energy. Likewise we can get a feeling for the bandha and prepare our energy and physical structures by holding a rolled up sock, a small bean bag, pad, or the like in-between the chin and sternal notch while lengthening the above mentioned distance of the occiput from top of scapula. Some teachers teach the use of jalandhara bandha as the operator in kumbhaka (restraining the flow of the breath so that the epiglottis closed by jalandhara bandha preventing any air from escaping or entering the top of the trachea. Others state that it is performed by pressing the esophagus against the larynx thus closing off the wind passageways this way. Using jalandhara bandha in this way may cause unnecessary strain and is not recommended (unless your personal teacher has instructed you). One may also be aware that the energy of jalandhara may be called forth in almost any pose (it being the preventative for the jutting out of the chin and a remediator of arrogance. It can be utilized in most asanas while breathing in order to relax the throat, lengthen the back of neck, and facilitate the energy flow between through the throat chakra. It is certain that the scalene’s muscle (running from the back of the cervical vertebrae to the front of the top two ribs are involved helping to open up the apex of the lungs and allow more prana to penetrate into the system and perhaps at the same time allowing the chest to raise further up. Yet like the other bandhas, jalandhara bandha is mainly an energy lock, which is best allowed to occur naturally and spontaneously once we clear out the obstructions in the body/mind preventing its spontaneous expression. The occiput is raised up and tilted slightly backward lengthening the cervical spine from the scapula. The hyoid moves backward and upward toward the back of the occiput. The heart moves forward as the armpit chest raises toward the chin which finds the sternal notch. Relax the throat and lengthen the neck so the chin can go down to meet the sternal notch, but not forward. In other words keep the occiput back as it raises so that the chin not only drops down, but also inward toward the spine. Create space at the back of the occiput up from above the atlas as the chin goes down and in, without moving the posterior superior cervical section of the neck (C1 and C2) forward but rather keep it posterior. Simultaneously however move the lower cervical at C6 forward (anterior) toward the chin or at least do not move it backward away from the chin. Keep C6 down toward the sacrum. Simultaneously move the heart forward, the kidneys backward and up, and the scapula downward away from the occiput. See to it that the jaw is not clenched, but rather relaxed and long so that the chin can drop. Many people have chronic TMJ problems which jalandhara bandha may correct over time, but who may not be able to perform jalandhara bandha until the jaw unwinds. One may visualize that the entire skull is being lifted toward the stars from a string attached at the lambda point (the topmost point where the parietal bone and occiput meet). ( Classically in pranayama, mulabandha is implemented first. After the breath has stopped. Always perform mulabandha first. Most of the time perform uddiyana second. Then jalandhara lastly. Always release jalandhara first and mulabandha last. The synchronization of jalandhara bandha in relation to the other bandhas and the breath is described in detail below in the section on the three bandhas (traya- bandha). The above bone/muscle presentation describes the outside mechanical form. Internally during breath retention the glottis is closed so no air can go in and out of the lungs. When the glottis is relaxed the throat (pharynx) opens to the lungs facilitating breathing, but when we swallow food and drink the glottis closes the common passageway of the pharynx off from the lungs (larynx) and opens it to the esophagus and hence the stomach instead. This is the process of glutination. Hence we can become more aware of the full process of jalandhara bandha by practicing swallowing, thus exercising and strengthening the glottis allowing the air to be held out or in of the lungs. This has a corresponding nervous system action which tones the vagus nerve. Mentally and emotionally both the powerful breathing and eating dynamics and their equally powerful emotions are affected by jalandhara bandha. Jalandhara bandha helps pump the energy through the throat chakra into the crown and keeps the energy that has risen to the crown, third eye, and talu chakras from sinking down, leaking, or being dissipated, so it may continue to circulate in the chakra system. Like most bandhas it is pratyhara bringing cleansing the corrupted energy in the throat area and arms and integrating it by bringing it back into the central channel. Do not create stress in the neck, throat, jaw, face, eyes, palate, shoulders, or anywhere else. Let it find a groove. Especially avoid allowing the chin to drop forward and down while the top of the neck comes forward, rather keep the top of the neck below the occiput erect, back, and long, allowing the back of the occiput (above the atlas) to swivel up as the chin moves down (rather than forward). Avoid collapsing the upper thoracic vertebrae as well. 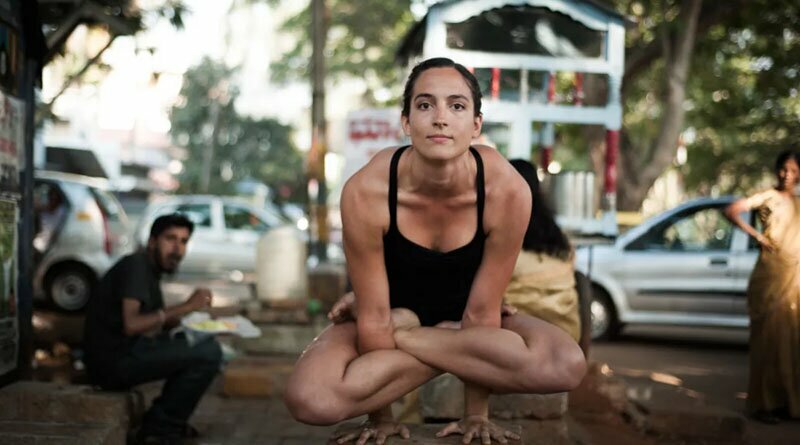 It is suggested to breathe fully when doing bridge, shoulder stand, halasana, knee to ear pose, and other asanas that force an extreme jalandhara bandha, but always avoid any constrictions/tightness of the throat as well as the breath. If you already have a flat neck (less than 10% of the population), then make an effort that the normal “S” shaped curve of the neck is achieved by making an effort to bring C1 and C2 posterior as the chin moves down and inward. The latter will correct a flat neck at the upper cervical spine.